It’s LAUNDRY WEEK at A Bowl Full of Lemons, so we are talking about all things laundry. On Saturday, I shared my organized laundry room with you and today I’m going to help you tackle the laundry piles. Hopefully you can learn how to finally conquer this daunting task. If you struggle to keep up with the laundry, don’t fret. It happens to all of us at some point in our lives. I used to stress over piles of laundry, but after I got into a routine, the piles are gone and it’s no longer an issue for me. 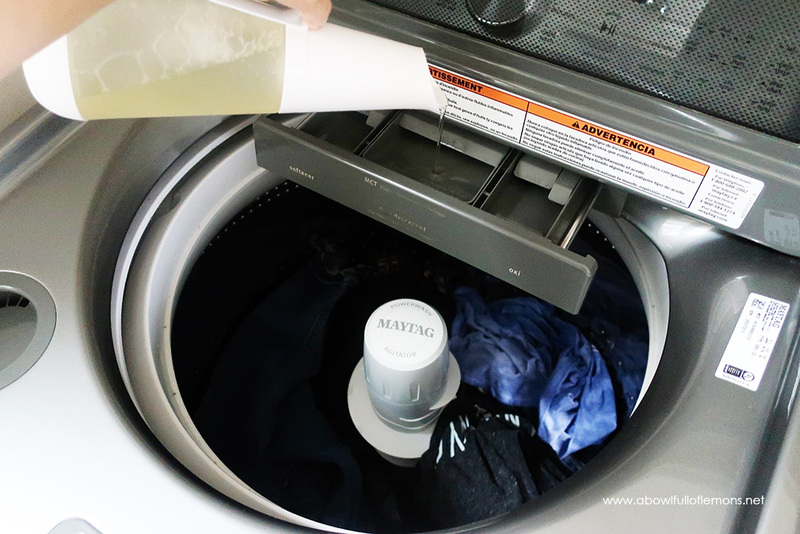 With the help of Maytag[, here are 5 tips you can implement to keep up with laundry. Wash one load of laundry every day. This process should include washing, drying, folding, and putting away the load. If you only do part of it, you’re just making more work for yourself. Just get it done! By doing this, you’ll find the laundry piles begin to disappear. 2. Prep your Washer. 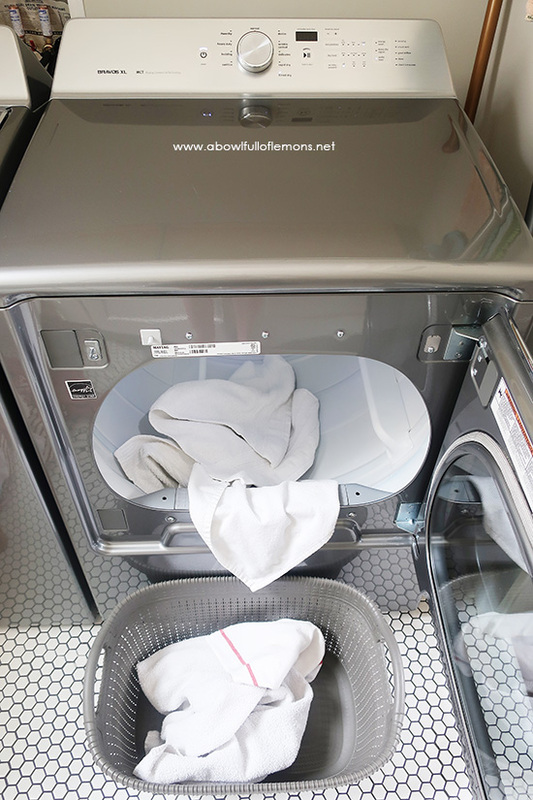 Get a head start on your day by prepping your washer for duty the night before. Before you go to bed, put a load of clothes into the washing machine along with the detergent. That way, once you get up in the morning, all you have to do is press start and you’re off to the races! People often ask me what washing machine and dryer I use. I went with a fabulous set from Maytag. I’ve had them for about 8 months now and I love them. I haven’t had any issues. They work great! 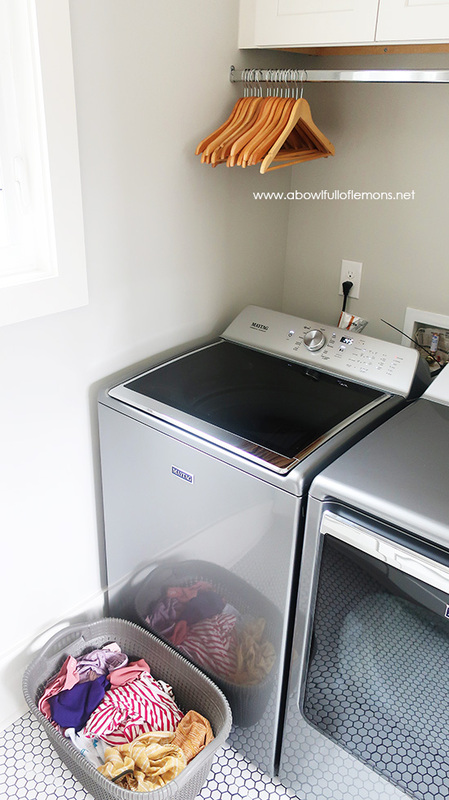 MY WASHER: I chose the Maytag® top load washer with deep fill option and power wash cycle. The PowerWash® agitator helps clean the clothes with efficient, concentrated cleaning, helping me get out all of those stubborn stains! The washer also has a huge drum – 5.2 cu ft to be exact – so I can wash almost 2-3 of my normal loads at a time. It’s such a time saver. 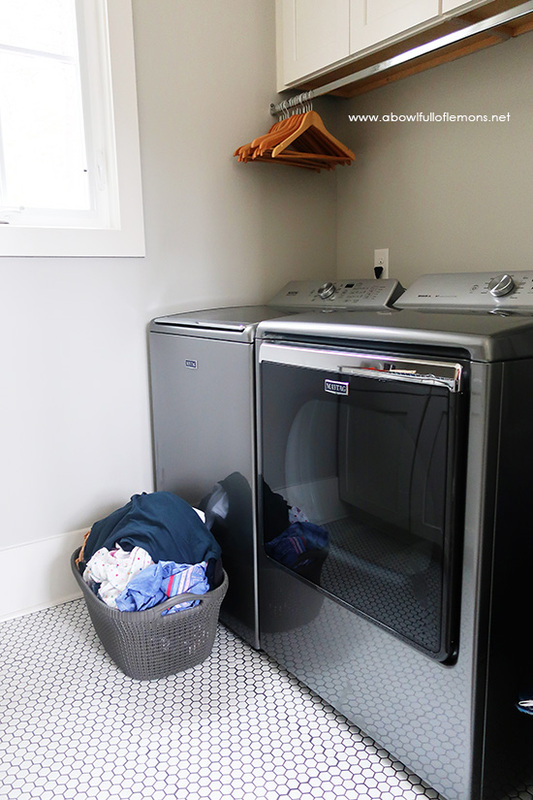 MY DRYER: I chose the Maytag® 8.8 Cu ft extra-large capacity dryer with advanced moisture sensing. I love it. Like the washer, it fits more of my laundry loads at a time so I am so much more productive with my laundry routine now. It has advanced moisture sensing to stop the load at just the right time – even with my largest loads. This is one of my favorite features, as it makes sure all articles of clothing gets dry, which saves me time. 3. Involve the rest of the family. Teach your kids how to wash their own clothes (if they are old enough to understand and safely complete the process). This includes your husband! If everyone were in charge of washing their own clothes and towels, life would be so much more blissful! Keep a laundry basket in each bedroom. When it gets full, have them separate their clothes and wash a load. Easy peasy. You can also teach your family helpful laundry tips, like how to decipher laundry symbols[ or get out specific stains. 4. Wear clothes more than once. This cuts down on the amount of dirty laundry that goes through the washing machine. You can wear jeans/pants, shorts, shirts, bras, pajamas, dresses & skirts at least 2-3 times. The only exception I have are workout clothes, wash cloths, and socks & underwear. Wash them after every use. And if you are a sweaty person, of course you will wash your clothes more often. The same goes with towels. Use them 2-3 times before washing. I promise, it won’t kill you. 5. Set a daily reminder on your phone. Whether it’s 6am or 6pm, set a reminder to go off once per day. Have it say “a load a day keeps the piles away” to remind you of why you’re doing this daily. Getting ready to cook dinner? No problem. 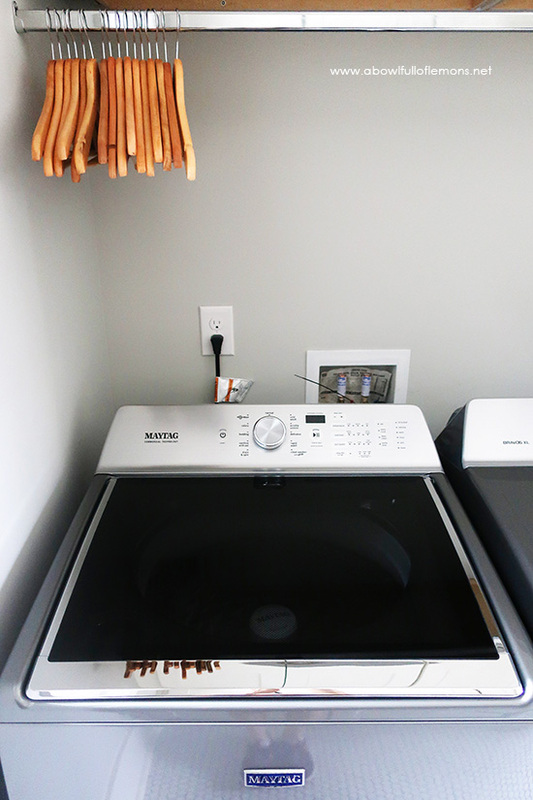 Set the timer for dinnertime and throw in a load of laundry before you start cooking. Switch it after dinner. A timer can keep you on track and eliminate stress. Multi-tasking is key! Remember to have the family help out! If you don’t have enough laundry to wash every single day, set up a schedule that works for you. Just don’t wait until the weekend when you have 8 piles staring you down. If your clothes are in piles all over the house, it’s time to implement a system that works. This tested method will definitely change your life and even full time working families can follow it. You’ve got this! 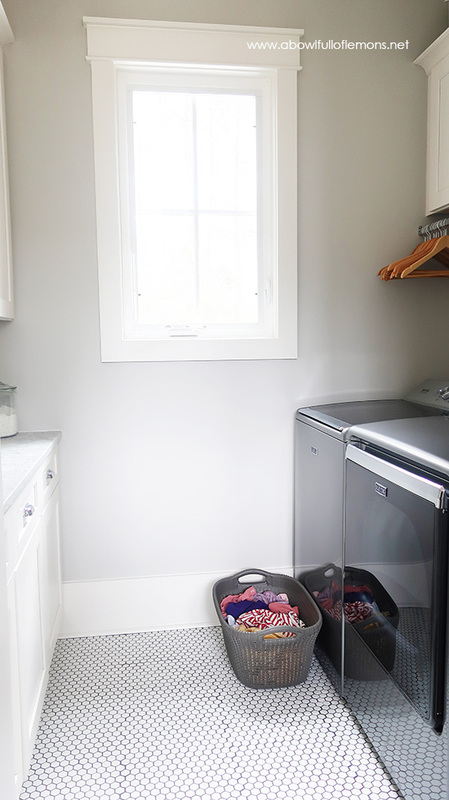 Be sure to check out my laundry room organization post and video.